The meeting started at about 10:50 last night and lasted till 11:20 p.m. Lawmakers present at the meeting include some senators like Dino Melaye and Chris Anyanwu, and House members like Zakari Mohammed and Razak Atunwa, who recently emerged the PDP’s governorship candidate in Kwara State. Saraki and 12 other aspirants are battling for the sole ticket of the PDP ahead of the 2019 general election. All the aspirants are making efforts to convince delegates who would decide the ultimate standard-bearer of the party to challenge President Muhammadu Buhari. 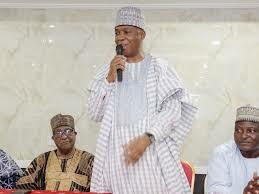 Saraki, who had vowed never to step down for anyone, is considered a frontrunner in the race.